Stenton is one of the earliest, best-preserved, and most believable historic houses in Philadelphia. Its distinguished Georgian architecture, its outstanding collection, and its superb documentation combine to create one of the most authentic house museums in the region. 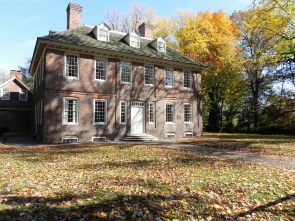 Built and owned by James Logan, Secretary to Pennsylvania founder William Penn, Stenton is a house of learning, past and present. The learning continues today as the National Society of the Colonial Dames of America in the Commonwealth of Pennsylvania work to “preserve and maintain Stenton as an historic object lesson.” Through tours, educational programs and special events, Stenton gives visitors a sense of what life was like in the 18th Century. Logan family papers (Collection 2023), The Historical Society of Pennsylvania. Stenton : the home of Penn's secretary by Alice M. Kellogg and published by the Pennsylvania Society of the Colonial Dames of America, 1904. The Historical Society of Pennsylvania.